Andrew McCutchen has had better years. On the 2016 season, McCutchen has had more lows than highs. Going into Monday’s game, he was hitting only .240 with an OPS (on-base plus slugging) 3 percent worse than the major-league average — easily the weakest batting numbers of his career — and he’s also been one of the worst statistical center fielders in baseball. Pro-rating his wins above replacement to 162 team games, McCutchen is on pace for a measly 1.1 WAR, which would be 68 percent worse than his previous career-low (3.4 as a rookie in 2009). His struggles rank among the main reasons Pittsburgh is under .500 with very little chance of getting back to the playoffs. In baseball’s modern era, McCutchen’s unexpectedly bad 2016 season ranks as one of the most shocking single-season mid-prime declines ever. If there’s any good news, it’s that most of the players in this group did manage to recover and play at a more respectable level going forward than during their down seasons. But even so, they were typically shadows of their former selves: The average player on the list above had 5.4 WAR per 600 plate appearances before his “bad” season, against only 2.8 over the remainder of his career (and only 3.0 over the very next three seasons). Although he’s also been slightly unlucky on balls in play, McCutchen’s numbers suggest a downturn in his underlying skill set. 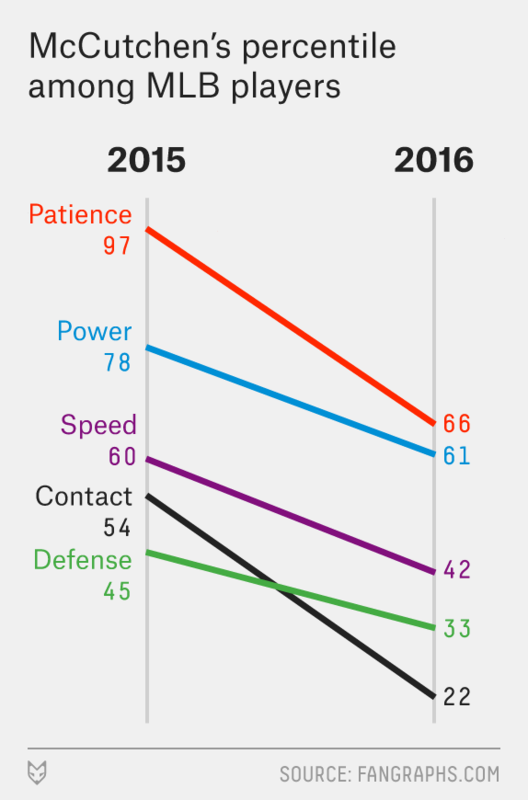 Even among the more fine-grained statistics, he’s hitting the ball more softly than ever and popping up more infield flies than ever. His average exit velocity is down, and he’s connecting on fewer swings than at any point in his career. Even great players can suffer bad seasons sometimes, and it’s not unprecedented for them to recover and play well after a down year. So maybe McCutchen will bounce right back to his previous Hall of Fame form. But what we’re seeing from McCutchen now is the bad kind of history: one of the worst seasons ever to land in the middle of a great player’s prime.